How many times have you heard yourself, or someone you know, say “Jeez, I’ve tried a couple of ports, but I’ve just never enjoyed them. They’re always so sweet and syrupy and just too much to enjoy”? If you were at dinner with us last night, you would have heard this at least half a dozen times. And with each utterance, I held myself back with sheer will power trying not to reach across the table, grabbing the guy by the lapels and say “Please tell me that you’ve tried every single style of port wine from several different producers, because if not, that is one massive generalization you’re making!” I’m pleased to say that I kept my cool, but I did learn one very important lesson: one month of port wine education can only do so much, but at least it’s a wonderful step towards breaking preconceived notions and mistruths as to what it is – a highly diverse style of wine that cannot fit neatly into a box and labeled ‘sweet dessert wine’. So, allow me to continue breaking down our assumptions of Port wine by introducing two styles that may be unfamiliar to you. Each of them fall outside of what we typically consider a “traditional” port wine, but both merit your attention. Don’t you love it when, yet another, acronym enters your life? I remember when I first heard the term ‘LBV’ and wondered if it was abbreviated because monolingual speakers like us tend to butcher most foreign names, but alas, there was no mystery. The name originated between the 1930’s and 1950’s, at the beginning of Antonio de Oliveira Salazar’s dictatorship when Portugal suffered from a rather serious economic hardship. Therefore, any wine destined to become a vintage port during this time period sat idly on its laurels waiting for a broker with enough financial backing to take it home. As a result, what should have been only two years in bulk after the harvest, eventually became three, then four, and finally six years, whereby christening the name ‘Late Vintage Port’. What makes an LBV interesting is that unlike a vintage port, which takes decades to age and mature so as to reach its pinnacle of perfection, an LBV has already attained a level of maturity and softness from those few extra years of aging. As I sit with five different LBVs in front of me, labeled with the years 1995, 2001 and 2003, I wonder if these are all considered ‘good’ vintage years. And if they are considered solid vintage years, are LBVs only from ‘declared’ vintage years. Jumping over to the IVP website, I’m told that only 2003 is considered a vintage year, while 2001 was only partially declared by half the houses, and 1995 was not declared at all. So if I’m reading this correctly, it appears that an LBV port wine can be elaborated in years that are not ‘declared’ for a vintage port, but are most often made in those same years. Now, I am led to question as to whether an LBV tastes different from a declared versus an undeclared year. While trying both the 1995 next to the 2003, I can honestly say that there is a considerable difference in both body and fruit, but is that a result of age, vintage or simply, the house style? The 2003 shows bold raspberry fruit flavors, silky fine tannins and a long, lush fruit finish that I don’t find in the 1995. To be honest, I find it to be more complex, richer and layered, showing stewed fruits, coffee, tobacco and middle eastern spices such as cardamom and nutmeg. Over the years, three different styles of LBV ports have evolved. Although all three port wines have come from a single harvest, they differ in their treatment before bottling. Filtered LBV: This is a LBV which has been filtered and/or fined and cold-stabilized before bottling, so as to prevent the creation of sediment. The benefit of not having sediment is that it not only removes any reason for you to decant, but it also brings you one step closer to enjoying your LBV the minute you open the bottle. By negating the need to decant, this style has become wildly popular in restaurants, bars and hotels, but as a result of heavy filtration, these wines can be stripped of their original character. As we taste the filtered LBVs next to the unfiltered LBVs, I, personally, cannot say that I noticed any lack in character. If anything, I find them to be loaded with bright fruit flavors and slightly silkier on the palate. Not to say that overly filtered wines, or wines which have sat in bulk for too long, don’t exist, but I wouldn’t write-off this style just because they have been filtered. Unfiltered LBV: Is exactly as the label indicates, a wine which has not been filtered or treated before bottling. These wines are said to be more full-bodied, and in some cases, have the capacity of developing for another five or more years in bottle. However, as a result of its age, sediment may have formed in the bottle, and thus, requires you to decant it. We, however, did not decant our unfiltered bottles of LBV, and I honestly don’t know if I would have dramatically changed my notes if we had filtered them. I can say, however, that I, too, found these wines to be bolder and more full-bodied than filtered port wines. I also found them to have a stronger grip on the palate, allowing the rich dark fruit and raisin notes to linger a tad longer than the unfiltered ports. Envelhecido em Garrafa or Bottle Matured: Like the unfiltered LBV ports, these wines have not been filtered or treated, but are required to spend at least 3 years in bottle before shipping. Those extra few years in bottle are said to give these wines a level of depth of complexity you won’t find with an entry-level LBV. Unfortunately, we were not able find any of these wines, but I look forward to trying them in the near future. Overall, I can say that I’ve really enjoyed tasting LBVs. Although they are vastly different from a vintage port, not quite Metallica versus Yanni, but more Outcast versus Coldplay, I’ve learned a considerable amount from tasting them both side by side and next to a vintage port. Like a ruby port, I generally found intense fruit flavors, but similar to a vintage, these notes are laced with a richer, spicier and more layered characteristics. Hence, if you want to enjoy a port that contains many of the same nuances as a vintage port, but want to spend half the price, I would highly suggest an LBV. Plus, as a result of their high acidity, our resident chef, Ryan, believes that an LBV would pair beautifully with desserts. While a vintage port tends to be dessert onto itself, an LBV has just enough vivacity to balance out a rich Tiramisu, chocolate tort or creme brulee. Personally, I haven’t had an opportunity to try a Colheita wine, nor have I heard of this style before we dedicated November to port wine. What I’ve learned over the past few weeks, both in Richard Mason’s book and through various online resources, is that Colheita, pronounced col-yate-a, is Portuguese for ‘harvest’ or ‘vintage’. Learning this, I immediately assumed a colheita is very similar to a vintage port, but I was wrong (first time ever!). Evidently, although a Colheita does come from a single vintage, it is a tawny port, aged at the very minimum for seven years in small oak barrels. And as a result of gradual oxidation and evaporation within these oak barrels, Colheitas are typically topped off with a wine of its same vintage. (My question is whether any of us would know the difference if a colheita port was topped off with a wine from a different vintage?) Consequently, the resulting wine has attained all of the nuances of a tawny port, while expressing characteristics of a single year. 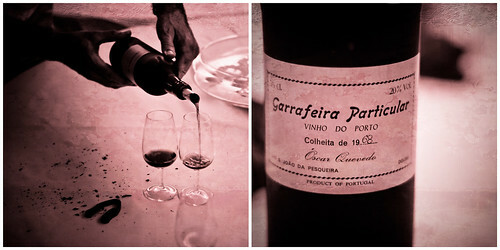 When shopping for a colheita port, it is suggested to keep note of two dates indicated on the label. The first date is the year of harvest, and the second is the year of bottling. Because colheita port wines do not generally improve in bottle, the later date indicates how long the wine has been sitting on the shelf waiting to be consumed. If the date of bottling is well after a year’s time, we’d highly suggest you look elsewhere so as not to taint your first colheita experience. Have you every tried a colheita or LBV port wine? If so, is there one you’ve particularly enjoyed? Are their particular foods you’ve enjoyed with them?